Now that November is here, we know the cyclocross season is in full swing with riders getting out to events almost every weekend. So far this year we have only talked about techniques for riding cyclocross and training for cyclocross. What is important to remember is that as soon as we pin that number to our jersey, we are racing cyclocross. After all, this is not tee-ball, only one person gets to win. While it is nearly impossible to accurately predict tactics before a race, and somewhat improper to critique them on the day after a race, we can still try to plan ahead for some “typical” scenarios. One of the catch phrases I like to hear the most is how “slow is fast”. Many racers would assume that fast is fast, but in reality it is absolutely critical to drive the bike in a method that keeps you moving forward and staying upright. Washing out in a corner or tripping over a barrier will cost you more time and finish placings than getting through the technical sections smoothly and effectively. In addition to a massive amount of core strength and conditioning work to help control the bicycle, we also want our riders to be able to produce power at low pedal cadences so that they can keep pedaling at steady speeds through “floaty/turny” race courses. This type of workout, using a very slow pedal speed but with a concerted effort to maintain a strong and steady core, is great to help you pedal through and out of fast smooth turns and keeps your overall speed high and allows you to stay at the pointy end of the race. One of the primary racing strategies I advise is to race the course when it is the hardest on everyone, including yourself. Hitting a hill or false flat as hard as possible is key to gapping the people behind you and gaining on those in front of you. We know that most races are an overall tempo level effort, only with extreme highs and lows. So having the ability to produce high speed at a tempo effort and being able to attack for an extended period of time is critical. A great training workout for this type of racing tactic is the one above where the rider pedals for an extended period of time at tempo, then attacks hard for a full minute at maximum level, then returns to tempo levels again. As overall fitness improves, the heart rate will recover faster and level out more smoothly during the steady sections. Remember that everyone is tired when the course is hard, that is why you have to attack. Unlike road racing where sheltering in the pack in critical, drafting out of the wind is less important in cyclocross. One of the interesting data points we have seen from analyzing races is how being at the front of a race is actually easier and faster for the individual than “following wheels”. Being at the back of a small group means you are tied to their pace and forced to react to the course lines they take rather than setting your own speed and moving forward at your own pace. In order to be able to get to the front of a small group, a rider must be able to accelerate from a seated position when the instant of availability occurs. These short intense efforts with a steady pedal speed are easy to replicate in training with repeated over/under workouts. These workouts adapt your system to pedal “harder than hard” for short periods of time, while overall maintaining that race effort. By looking at this file, you can see how the rider shifts to a harder gear (rather than change cadence) and back again every 30 seconds, but overall maintains a threshold effort. This trains the system to make those three person jumps that are critical to changing position in a group of racers. Also note how the heart rate drifts upwards as the efforts continue. These are hard efforts. Unlike some road races, corners in cyclocross must often be taken at slower speeds to maintain control, but coming out of those corners hard and fast is a fantastic opportunity to gap your competition. We like our athletes to do high torque training to help them attack out of slow corners. By already being in a harder/faster gear they can create a gap quickly to the riders behind them. We like to create this high torque strength by doing short sprints from slow speeds or even completely stopped. A rider should hold the bars and use their shoulder, core, and legs to accelerate as hard as possible. A coaching colleague of mine describes it as “breaking a piece of firewood”, stomping with the legs and pulling up with the hands. You can see from looking at the training file how the rider’s power goes down to zero and then immediately and suddenly jumps to a near maximum level. We also try to hold a hard power level for a few seconds afterwards to replicate a course section after those hard corners. Also note how the heart rate lags a few seconds behind the power effort; it is important to remember to do these workouts by power or “wicked hard” by feel. Once you have started riding and having fun at cyclocross, it is much more fun to race effectively and move your way up the results page today, and most importantly up the start grid tomorrow. 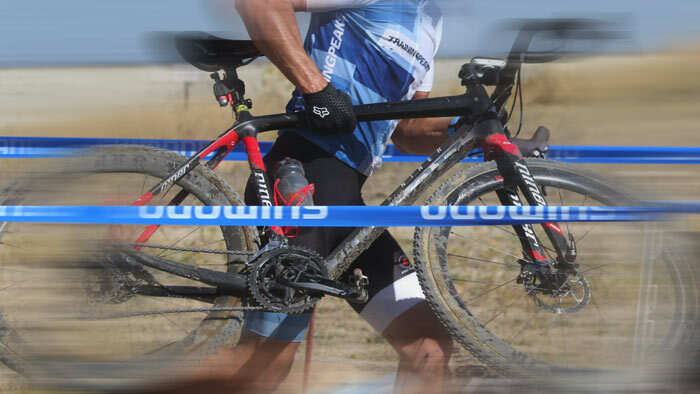 Working with a TrainingPeaks certified coach allows you to combine these tactics and workouts together at the right time so you can finish up your cyclocross season in style. As a full time cycling coach, I feel this is the most important tactic of all.